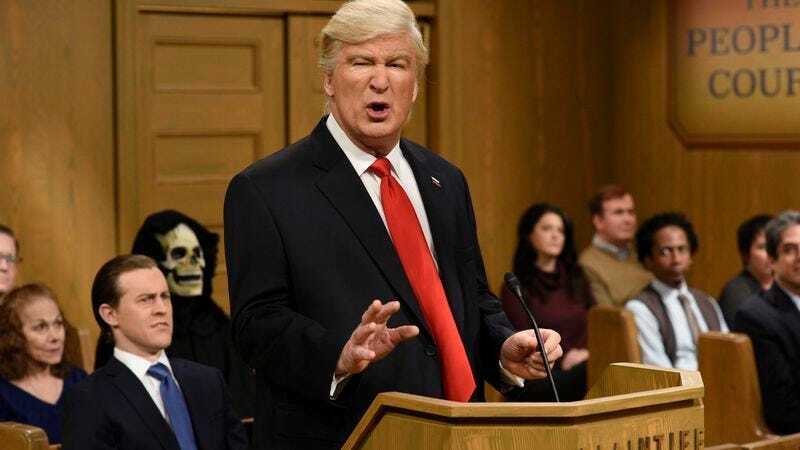 Despite admitting that donning the Donald’s ridiculous hairdo’s become a bit tedious, Alec Baldwin is now committing his impression of Trump to the written page. According to The Hollywood Reporter, Baldwin is teaming up with Peabody winner and novelist Kurt Andersen to write a book about No. 45. The book—which will undoubtedly net the highest of profits, as well as the the biggest and best reviews—is titled You Can’t Spell America Without Me: The Really Tremendous Inside Story Of My Fantastic First Year As President Donald J. Trump, and will be published by Penguin Press. It sounds like it won’t be a book about Baldwin’s tenure impersonating Trump for Saturday Night Live so much as a fake memoir written from his perspective, which could mean it’ll just be a picture book. In any case, You Can’t Spell America Without Me is set to hit shelves on November 7, the day before the (other) day that will live in infamy.